Does the Team Think? was a farcical, largely unscripted version of more serious discussions featuring comic performers like Jimmy Edwards, Ted Ray and Arthur Askey. Jimmy Edwards thought up the idea and MacDonald Hobley was the chairman . Occasional celebrity guests would be invited to put a special "off the cuff", none too serious, question in the middle of the show. These were usually marvellous springboards for the quick witted Ted Ray to fire off a stream of very funny one-liners. These celebrity guests included, at one time or another, Irene Handl and Bernard Bresslaw. 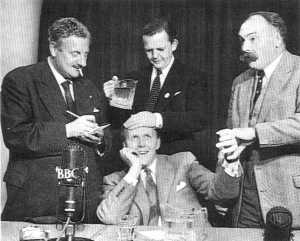 The panel's line up included Cyril Fletcher, Tommy Trinder and Cardew Robinson as the fourth man on the panel supplementing the regular three Jimmy, Ted and Arthur. The show ran until the 70s.